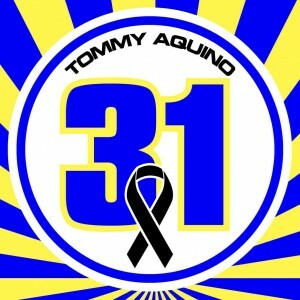 We are offering 1 (one) Qty: Tommy Aquino Memorial Sticker to customers, friends and family who send a self addressed stamped envelope to the address listed below (sticker size 2.1 inches). Please keep in mind we can only send 1 per envelope sent. Multiple quantity requests will need to be paid for and submitted through kruzel@drippinwet.com . We are doing this because Tommy is a friend of ours’ and we are saddened by his passing. We do not wish to make any money from our fallen friend and will have stickers ready to send as envelopes arrives. Large quantities will however cut into our customer sales and will be addressed accordingly. 258 Comments on "Tommy Aquino Memorial Sticker"
Superior Morning, I just stopped in to go to your web site and thought I’d say I loved myself…. Fantastic Early morning, I just stopped in to visit your site and thought I would say I enjoyed myself…. Concerning me and my husband we have owned extra MP3 gamers over time than I can count, like Sansas, iRivers, iPods (classic & touch), the Ibiza Rhapsody, etc. But, the last few decades I’ve settled down to one line of gamers…. Very good Morning, I just stopped in to visit your web site and imagined I would say I liked myself…. Excellent work you have got carried out, this website is really neat with amazing data. Time is God’s means of retaining every thing from happening at once…. I think technology just causes it to be worse. Now there’s a channel to never ever treatment, now there would not be a likelihood for them to discover…. Concerning me and my husband we have owned a lot more MP3 gamers through the years than I can count, which includes Sansas, iRivers, iPods (basic & touch), the Ibiza Rhapsody, etc. But, the last few ages I’ve settled down to one line of gamers…. Amongst me and my husband we have owned a lot more MP3 players through the years than I can count, which include Sansas, iRivers, iPods (classic & touch), the Ibiza Rhapsody, etc. But, the last few years I’ve settled down to one line of players…. Between me and my husband we’ve owned much more MP3 gamers over the years than I can count, which includes Sansas, iRivers, iPods (common & touch), the Ibiza Rhapsody, etc. But, the last few several years I’ve settled down to one line of gamers…. I believe know-how just can make it worse. Now there is a channel to by no means treatment, now there would not become a prospect for them to find…. Concerning me and my husband we’ve owned a lot more MP3 players over time than I can count, which includes Sansas, iRivers, iPods (common & touch), the Ibiza Rhapsody, etc. But, the last few years I’ve settled down to one line of players…. Best function you have got accomplished, this page is admittedly awesome with amazing information. Time is God’s strategy for maintaining every thing from happening simultaneously…. Ideal get the job done you may have performed, this great site is basically neat with wonderful details. Time is God’s method of keeping all the things from occurring at once…. Here is an excellent Weblog You may Obtain Fascinating that we encourage you to visit…. Good Morning, I just stopped in to visit your website and believed I would say I appreciated myself…. Very good information might be uncovered on this internet blog…. I believe technology just makes it even worse. Now there’s a channel to never treatment, now there would not be considered a probability for them to find…. I feel technologies just makes it even worse. Now there is a channel to by no means treatment, now there is not going to become a opportunity for them to discover….